Archpries Fr. Nerses Manoogian, with the baptismal name of Haroutiun was born in Beirut, Lebanon. 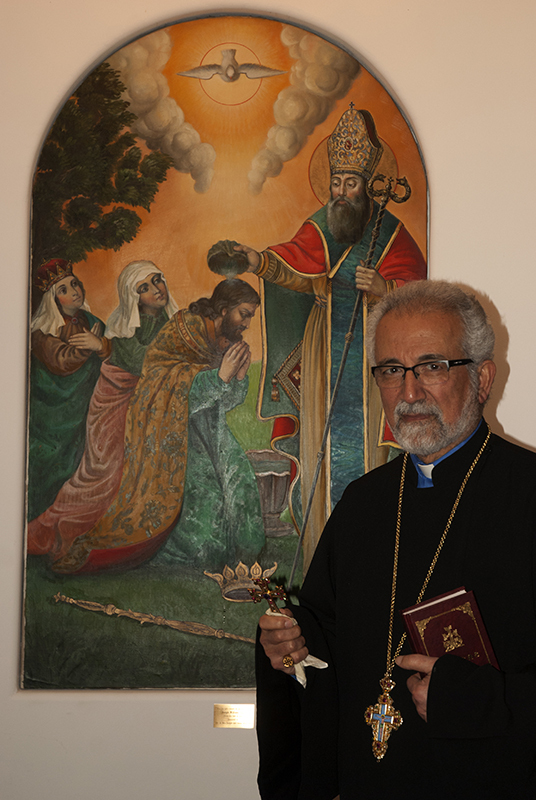 He is a graduate of the Armenian Theological Seminary of the Catholicossate of Antelias, Lebanon. He was ordained Archdeacon by his dean, Bishop Karekin Sarkissian, the blessed memory, the former Catholocos of all Armenians of Etchmiadzin. As Archdeacon, he served the two Armenian communities of Isfahan and Abadan, in south Iran. in 1974 he married Nektar Megerdichian and blessed with two children, Sevag and Sally. From 1981-86 he was invited by the Prelate of Eastern Prelacy, His Eminence Archbishop Mesrob Ashjian, to serve Detroit Community in the capacity of Armenian Studies Program Director in the ARS Day School, principal of the five Saturday Schools and Choir Director of St. Sarkis Armenian Apostolic Church of Dearborn, Michigan. He was ordained priest on February 22, 1987 by the Prelate, His Eminence Archbishop Mesrob Ashjian in New York and was assigned to St. Gregory Church parish in Granite City, Illinois. He received his Master of Arts Degree in Religious Studies from St. Louis University in Spring of 1991. Upon Graduation he was assigned to St. Gergory Church parish in Philadelphia. Der Nerses brought into life the womens organization called Altar Guild with the sole purpose of taking care of the needs of the altar. Another program Der Nerses has brought to life is the program of Altar servers. It is a program which gives opportunity to our youngsters to serve the altar as candle bearers, fan bearers and censer bearers thus giving them a sense of belonging. He has been as well one of the co-founders of the Prelacys St. Gregory of Datev Summer institute for the youth and active teacher of the Institute for the last 15 years. Fr. Nerses Manoogian Served on the Religious Council of the Prelacy as well for 11 years.